Below are a bundle of handprint & footprint baby shower ideas & decorations for throwing the perfect baby shower! Here's a cute cake saying or baby shower invitation wording idea! We have gathered up some cute ideas and product suggestions for a baby shower that is all about "baby prints!" Bake a batch of feet shaped sugar cookies! You can find cookie cutters at your local craft store or online. Wrap them up in cellophane and tie with a snazzy bow - add a favor tag and hand out as favors and prizes. You can also put them on a cute platter and serve them as snack at the shower. Everybody loves cookies! 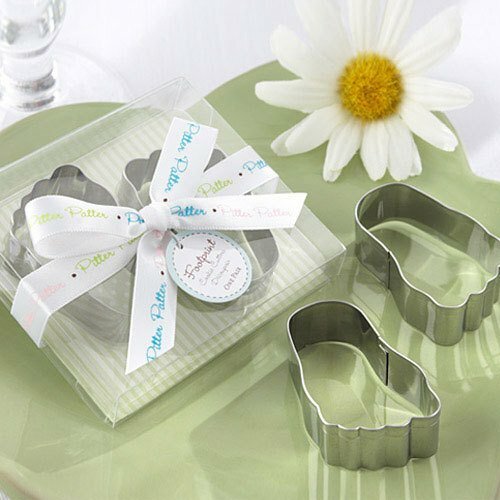 Package them up in cute containers and give away as baby shower favors or prizes. Attach a cute note or favor tags saying "From Our Shower to Yours!" 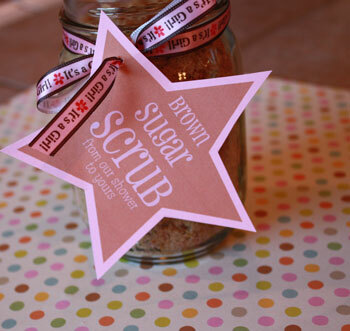 Click on the picture below to get a FREE recipe for making "Brown Sugar Scrub Favors" (it's so affordable to make and so easy - the ingredients are items you already have in your kitchen!) - I even made a Free printable favor tag for you to use! If you have access to a real baby's hands and feet, stamp them onto white paper using pink and blue stamp pads or non-toxic paint and use as a tablecloth or wrapping paper. Buy some "baby feet and hands" scrapbook paper from your craft store and use it for all kinds of clever decorating ideas! Cut out strips of the paper and wrap around bottled water to make cute labels! Using tag board or construction paper, cut out feet and hand shapes (you can trace a small child's) and hang them from the ceiling using thread or fishing wire. Add glitter to jazz them up! Place a cute sign by all of the baby shower snack saying "Finger Foods"
Save money and grab our FREE printable favor tags - we made them just for you!